In practice, this is a war on a century’s worth of work to keep our air and water clean; our food, drugs and workplaces safe; the rights of employees protected; and the marketplace fair and unrigged. It’s one thing to make regulations more efficient and no more intrusive than necessary. It’s another to say that all the structures of democratic government designed to protect our citizens from the abuses of concentrated private power should be swept away. The Senate voted, 50-48 to repeal the Volks rule, and the House voted 231 – 191 last month to repeal the rule. Employers are still required to retain accurate injury and illness records for 5 years, but there is no way now for OSHA to enforce any violations that are older than 6 months from the time a citation is issued. 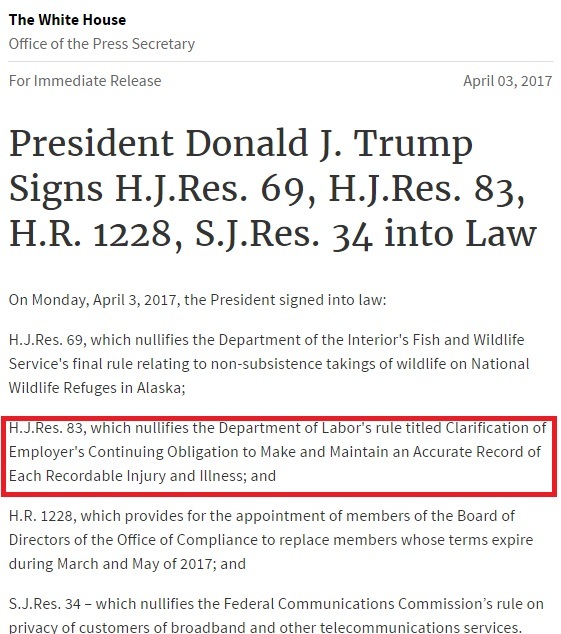 This means, effectively, that there will be no more large OSHA recordkeeping cases similar to those which throughout OSHA history — in Democratic and Republican administrations — have impacted entire industries. Bottom line: Low road employers will get away with cheating on the OSHA logs, workers will no longer have access to accurate information about where injuries and illnesses are happening in their workplaces, good employers will no longer be able to compete on a level playing field with bad employers, and more workers will get sick, injured and killed in the workplace. This action will also be a blow to accurate national statistics on workplace conditions assembled by the Bureau of Labor Statistics (BLS), which is why two former BLS Commissioners — from the Obama and Bush administrations — appealed to the Senate not to kill the Volks Rule. Former OSHA Assistant Secretary Dr. David Michaels made one last ditch attempt to convince the President via an open letter and on Twitter. Apparently the Tweeter-in-Chief, who purports to work for the benefit of working people, doesn’t much care about the damage he’s causing to the health and lives of workers in this country. More on the Volks Rule here. The Volks rule was an attempt to defy a ruling of the D.C. Circuit. If OSHA did not like the ruling, it had every right to petition the Circuit for rehearing, or file a petition for writ of certiorari to the Supreme Court. It did neither, for reasons never explained. Instead OSHA issued the Volks rule, which “clarified” that the agency chose to ignore the ruling of the D.C. Circuit. Wrong. One judge on the court (Merrick Garland) found that the current OSHA interpretation was unclear (even though OSHA had been enforcing the 5-year requirement for 40 years). Both DOL and Justice felt that clarifying the requirement would satisfy the court. Clarifications of long-standing OSHA practice struck down by the courts have been dealt with in similar ways before, such as the requirement that employers pay for personal protective equipment during the Bush administration. Would this have passed the court test? Again, DOL and DOJ thought it would . But of course, we’ll never know now. Here’s the part of the Obama OSHA argument I can’t reconcile: Assuming arguendo that the Volks reg was legitimate, where does that leave the language in the OSH Act specifying a 6 months statute of limitations? Wouldn’t the Volks reg have (and we can now speak in the past tense) rendered that a nullity? And if so, where does OSHA get the authority to “interpret” away statutory language? I’m familiar with that part of the opinion, and that’s my point: how does OSHA defend this reg given the way it would have thoroughly repudiated the statutory language? Secondly, you missed one of OSHA’s options: they could have gone to Congress to get the statute changed. In all of the Democrats’ bills to reform Congress, on several of which Jordan actually worked, not once did they go after extending the statute of limitations. Jordan, I disagree. One, Judges Karen Henderson and Janice Rogers Brown ruled that the language of the OSH Act was clear on this issue, and that OSHA cannot “interpret” an unambiguous statute. That’s Chevron 101. Only when a statute is ambiguous does an agency have an opportunity to interpret its enabling statute. Two, simple arithmetic demonstrates that two is greater than one. A concurring opinion does not overrule a majority opinion. Just because one judge wrote it down does not make it the law. I’m sure you can appreciate when you read a concurring opinion from any judge whose viewpoints do not necessarily match up with your own. Say, like maybe Justice Clarence Thomas. Regarding the decision-making process of the DOL and DOJ attorneys involved, can you share their reasoning on why they did not petition the D.C. Circuit for rehearing, or file a petition for writ of cert with the Supreme Court? When a dissatisfied party does not like an appellate court ruling, those are the two ways you normally go about attempting to get the decision reconsidered and reversed. The Volks rule written by OSHA was ultimately going to end up back in litigation in front of the D.C. Circuit, which is bound to follow precedent and would have struck it down. Mansatori reporting had weakness and flaws in the checks and balances. Who verified companies were reporting the mandatory injuries and illnesses? There is strong desire (not always action) to keep safety numbers down to the point of not reporting all injuries. Case in point was in Woburn Massachusetts. The fix is to require employers to post what they report to OSHA each quarter for employees to see and verify with OSHA. “Easy” fix but will it be done? If not, why not?